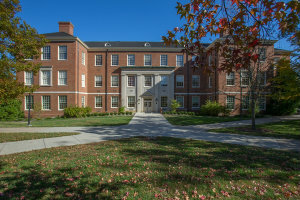 Miami University established the Alumni Teaching Scholars Program in 1978 with the support of a three-year grant from the Lilly Endowment. The Program won the 1994 Hesburgh Award, given to the best faculty development program that enhances undergraduate education in the United States. Community membership is made available by invitation to tenure-track faculty in their second through fifth years and clinical faculty/lecturers with less than seven years teaching in higher education. This community assists members in developing their teaching abilities and interests by enabling them to participate in a two-semester series of special activities and to pursue individual projects related to teaching. The Teaching Scholars receive financial assistance for their projects and reduced teaching assignments during one semester. They select and work with experienced faculty who agree to be mentors and with students who are involved as consultants. Each Teaching Scholar selects an experienced faculty member to partner as his or her mentor. The mentor can be from the same department or from another department. The structure of the Teaching Scholar-mentor relationship is flexible. For example, mentors and protégés may attend one another’s classes, discuss teaching philosophies, and explore University issues together. Each participant selects one or two student associates who provide student perspectives on the topics and practices covered in the Program. The Teaching-Learning Community activities include the development of scholarly teaching and the scholarship of teaching. First, participants are introduced to the literature through several readings and seminars. Recent seminar topics include the evaluation of teaching, enhancing the teaching/learning experience through awareness of students’ intellectual development, the effect of gender on the teaching/learning process, sharing student and faculty views of teaching and learning, and the scholarship of teaching. In November, participants attend the Lilly Conference on College Teaching, where they interact with nationally known teacher scholars. The Teaching Scholars pursue self-designed learning programs, including a teaching project, for which they receive financial support. Past projects have included developing expertise and courseware for computer-assisted instruction, redesigning an ongoing course, and learning and trying a new teaching method. Each Teaching Scholar assesses changes in student learning as a result of his or her project. Finally, in April at the ATS Teaching and Learning Symposium, the teaching scholars present to the campus what they have learned. Through these activities, the teaching scholars become involved in the scholarship of teaching and learning. If you are interested in applying, discuss your participation with your department chair. You must obtain the endorsement of your chair and dean when you apply. You will need to plan for reassigned time from one course for fall or spring semester; your department will receive funds for course replacement coverage at the casual rate. Our mission is to model and promote engagement with scholarly and reflective teaching practices to support the academic development of all faculty and students.